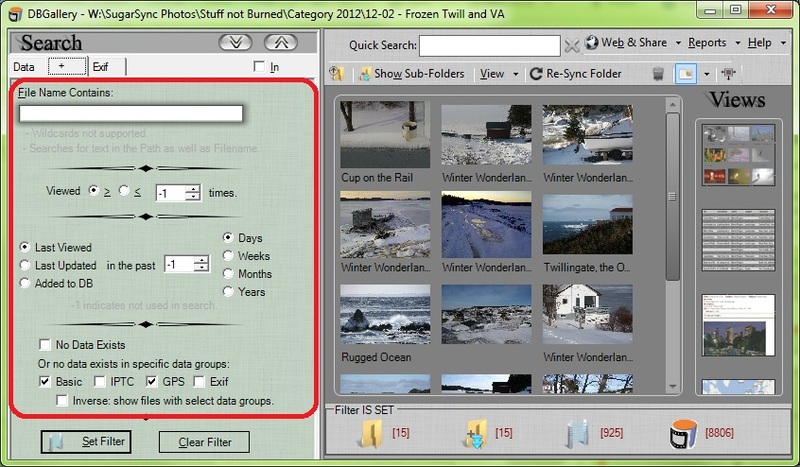 The search capabilities of DBGallery go well beyond what Windows or almost any other image/file search software offers. For example, the screenshot below shows unique and easy to use search options. While they seem innocent they are surprisingly powerful.I get frustrated when I can’t find images I know I added put on my computer just this morning or something I know I viewed just a couple days ago. I also want to know which images have certain data so I can ensure they at least a rudimentary data tags. The common scenarios below go over how to do these and several other useful searches. Surprisingly, it’s extremely hard to find software which lets a person find files or photos this way. SharePoint doesn’t, for example, and neither do any of the other commonly used photo software, such as Picasso, Adobe Bridge, PicaJet or ACDSee. Scenario A: You or someone else added images today and you’d like to know which photos they were so you can ensure they’re tagged and categorized properly. Solution: Choose “Added to DB” and 0 Days, press Enter, and those images will show up!Scenario B: You cant’ find the image you’re looking for but know you viewed in within the past couple weeks. Solution: Select “Last Viewed” and 3 Weeks, press Enter and within the resulting list you will almost surely find that image.Scenario C: Several images were added from difference sources recently. You would like to know which have no tags nor GPS location information. Solution: Select the “Basic” and “GPS” checkboxes, press Enter, and shown will be images which have nothing whatsoever entered as Title, Subject, and Keywords as well as no map coordinates. Scenario D: A map view of images is what you’re looking for. Any images without map coordinates are irrelevant. Solution: Select the “GPS” and “Inverse: show files with select data groups”, press enter, and like only image with map coordinates appear. You would typically switch to Map View to see these if you haven’t already. Scenario E: You’re looking for only the most popular files across the entire database to discover which are the most viewed by you and others. Solution: Select the “>” (greater than) radio-button to the right of “Viewed” and choose 50 or 200 to see how many images have been view that many time. Scenario F: You’re looking for images which have never ever been opened across the database. Solution: Select the “<” (less than) radio-button to the right of “Viewed”, then choose 1 in the number of times box. This will show all images which have never been viewed. Alternatively, set it to 1 or 2 or 5 to determine how many images have rarely been opened for viewing. I didn’t use these when they first became available in DBGallery. After trying them out I don’t know how to live without them. Give them a try yourself and I’m pretty sure you will find working with your collection a fair bit more effortless and pain-free. This entry was posted in Digital Photography, Photo Organization and tagged assets, Collection, DBGallery, digital, fundamentals, photography, photography. image, shared photo database. Bookmark the permalink.